At Miller Gasket we specialize in precision water jet cutting, and have been delivering quality products and services to our customer for over 50 years. 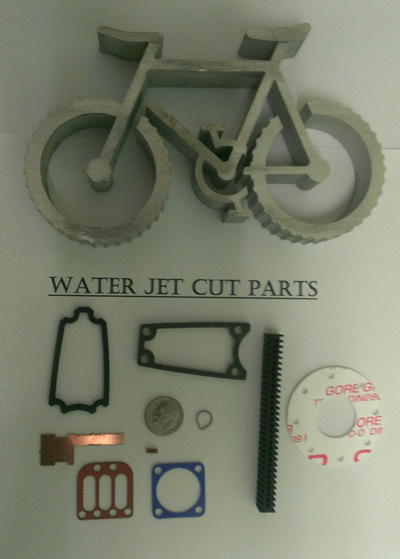 We operate water jet cutting systems that features a 94,000 psi water jet that can precision cut materials such as metals, felt, foam, rubber, cork, plastic, just to name a few. This system also allows for the cutting of materials in sizes up to 13.5’ x 6.5’ and up to 8” thick, to tolerances of ±.003”. Our dynamic cutting head provides a straight cut without any tapering and leaves a smooth finished edge. The greatest benefit to water jet cutting, apart from the low cost is that it subjects the material being cut to minimal stress which prevents thermal distortion and hardening. This reduces or eliminates the need for secondary operations, as well as lead time and cost. Cost can be further reduced by nesting thinner material during the cutting process. We provide typical lead times as short as 3 weeks, and also offer a 24 hour turnaround prototyping. We serve a wide range of industries including the automotive, electronics, and lighting industries. 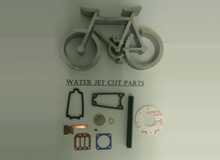 For more information about our water jet cutting capabilities, see the table below, or contact us for more information.